The last few months a certain object demanded my attention. In books, in my dreams, on the internet in places you wouldn’t expect… It took me some time before I figured it out, but in the end the message was clear: ‘the universe’ wanted me to pay attention and learn about… witch balls! Of course I had heard about them but I never really did something with it. Witch balls are hollow spheres of coloured glass that often contain a few thin fibres strung inside. They seem to originate in cultures that believe in harmful magic , evil spirits and such, to ward those off by hanging a witch ball in the (east) window or entrance of the home. As to how it works, the stories vary slightly. Evil is drawn to the ball which absorbs the negativity and keeps it from entering the home. Witches were believed to be attracted by the shininess and beauty of the ball, they touch it or go into it and are lost inside. It could also work like a magnet: the ball itself is charged with positive energy and thus it attracts and absorbs the negative energies. Or even simpler: the mirroring of the balls reflects evil back to where it comes from. No one knows exactly what or where the origin of the balls is. The ability to make and blow glass is a very old skill. Some sources date back the witch balls to Medieval Europe, more than six centuries ago, or even earlier. At that time the form would have been rough and not very well-defined. On the 18th (England. Europe) and 19th century (America) witch balls were moulded in a more refined shape with use of higher quality glass. They became very popular and were also seen as a sign of wealth and prestige as they weren’t cheap. Some people still believed they helped against evil, witches etc. though; others called it superstition. Trying to get rid of old lore they were also called fairy orbs: the beauty of the balls was told to attract fairies, who would then show their appreciation by bestowing the owner with good luck. The balls showed up in a larger form in gardens, and smaller in Yule trees. Are they connected? It’s certainly possible but debatable. 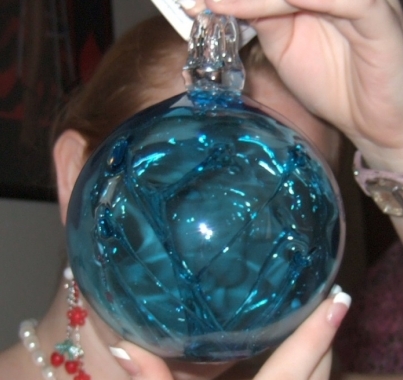 Still, glass workers traditionally make a witch ball as the first object to be created in a new studio. Nowadays there are lots of beautiful witch balls for sale. For protection, for decoration, or both. Funny enough you often see them at the homes of the very people they were used against to scare them of at first: witches! Perhaps a lot of sources got it wrong, and witches are the origin of witch balls. They could have been the ones that made them for protection of their homes. Or they used them for scrying, or collecting solar and lunar light or other magical uses. Who knows..
Fishermen use floating balls for their nets. In earlier days they were made of glass. Those glass balls resemble witch balls, so they were often used for that purpose too. It’s probably also the reason why witch balls are associated with sea superstitions and legends in some lore. At the moment I have two ‘witch balls’. One of them is definitely used by fishermen. It was found on the beach and has barnacles attached in several places. The other one could be a fishing-net ball too, but I think it is mainly used for decoration. When we were kids my sister had a fishing-net on her ceiling with the glass balls still in it. 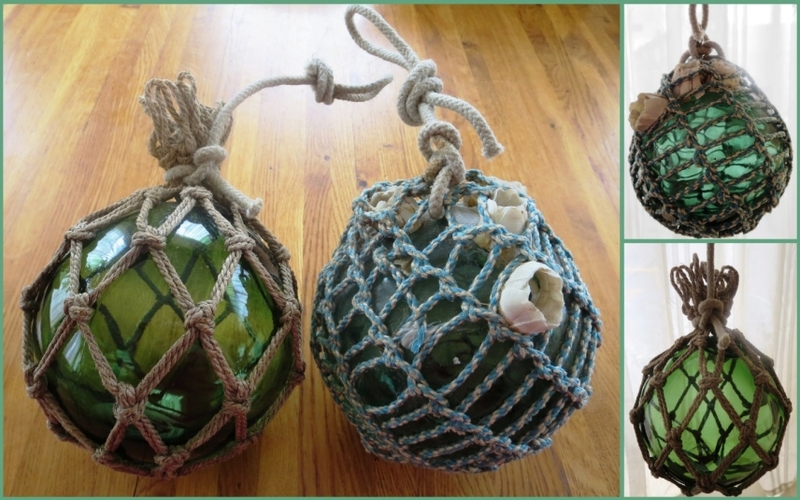 The ball with barnacles will get a nice place in our living room. We live in a fishing-village close to the harbour and sea so I guess it’s the right place for it. The other one will hang in my temple room window. Yes, as decoration, but I will certainly charge them to protect our home and reflect or absorb evil. And many more… just search for ‘witch ball’! ?